As kids we often were home alone with Aai on Kojagiri nights, as Baba used to be away for work. Aai chose to keep a low profile social life, especially when it came to late night events. 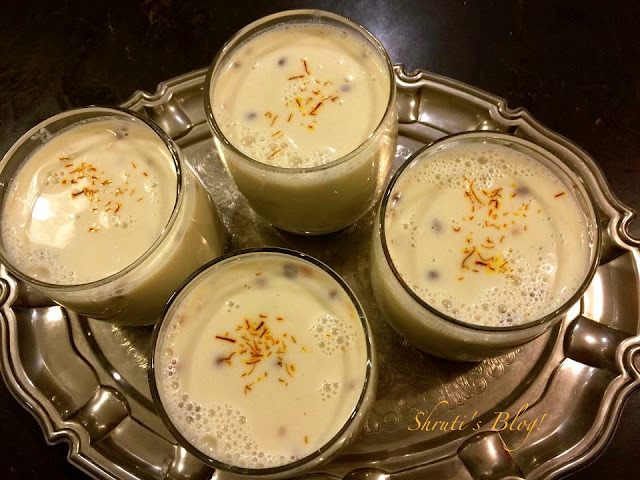 As a result, our Kojagiri nights used to be quite tame, with Aai making the masala doodh and we all peering into the silver “pela” to see the moon’s reflection in the milk. Aai would do “aukshan” to Dada, as he was the first-born, but would also include me saying I was her first-born daughter. Then we would sip on the delicious milk, listening to stories Aai would tell. How our chests swelled with pride as we listened to the tale of Shivaji Maharaj, pacing the ramparts of the Raighad Fort, on a bright Kojagiri night. It is said that on this night, goddess Lakshmi visits every house asking "Ko Jagarti?" and endows those who are awake with prosperity. Legend has it that on a Kojagiri night, the warrior king was looking at the star-studded sky of a Sharad Poornima. The brightest night of the year overlooked a very troubled state of affairs on the earth. The rapid invasion of the Moghuls and the lack of unity amongst the kings and chieftains worried the great king. This was a portent, and he replied “Aham jaagarami! Aham jaagarami!”. “Ajun ek, ajun ek…” the cry went out – almost an automatic response -to the end of a story. So our night wore on, bringing a lump in our throats as we listened to the story Hirkani who risked her life to slide down a steep cliff to be with her child. Hirkani, the milk maid used to sell milk at Shivaji Maharaj’s Raigad Fort. She would make the trip from her village at the foothill of the fort, leaving her baby at home. Once, on a Kojagiri day, she got delayed selling milk and missed the curfew time and the gates of the fort closed and the guards refused to let her out. Worried about her baby, Hirkani, slid down the very steep cliff and reached home to feed her baby. It would be much before mid-night when we drifted off to sleep, our senses lulled by the sweet warm milk and the soothing stories, but our sensibilities kindled forever. 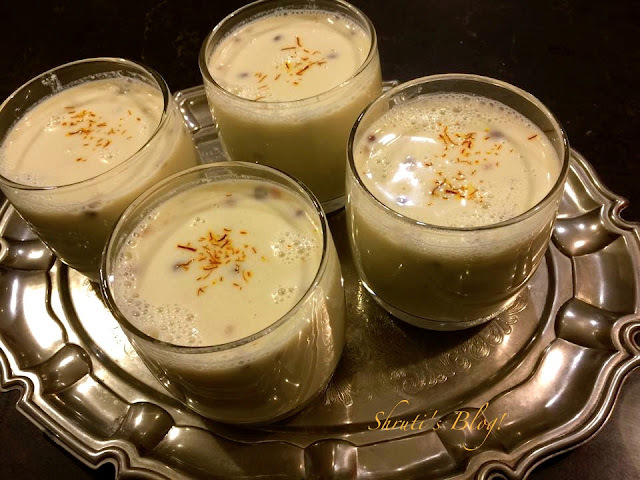 This year, I made the masala doodh for my girls and told them these stories once again. The doodh had to be vegan, since they both have embraced veganism. So I used all plant based products to make it - a milk of human kindness in the real sense, but equally warm and comforting –even more so! Soak a cup of cashews and blanched almonds in hot water for about half an hour. Peel and cube a very tender green lauki/ bottle gourd. Add the soaked nuts with the water and the lauki/bottle gourd and blend it very smoothly. Transfer this mixture into a heavy bottomed saucepan and let it come to a rolling boil slowly until the bottle gourd is cooked completely. Add the saffron and the spices as well as the charoli while this is still hot, to allow the flavours to infuse. Add the soymilk at this stage. I don’t like to boil soymilk; it tastes creamier when not boiled. Add the sugar/sweetener according to your preference. Serve warm or chilled. Shard cha garva ' tithe doodhat utarla ka? Chanchu.